Chief of Staff for the Armed Forces of the Islamic Republic of Iran says Iran and Iraq have agreed to establish further cooperation in air defence area. 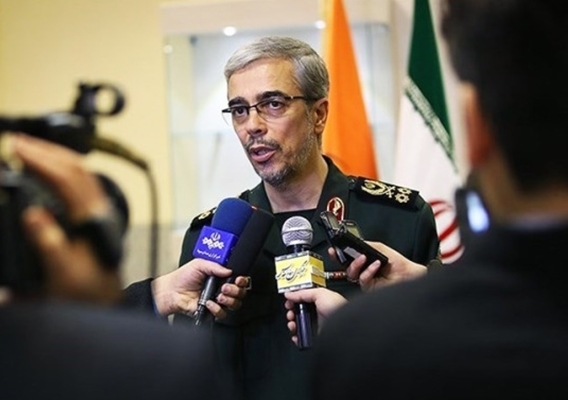 Briefing reporters on his Saturday meeting with his Iraqi counterpart in Tehran, Major General Mohammad Baqeri said Iran and Iraq have warm relations in military areas. “Iran and Iraq have deep commonalities. Our relations with Iraq are different from those with other countries because Iran and Iraq enjoy common interests and are exposed to common threats,” he said. He then referred to the great number of Iranian religious tourists visiting Iraq each year and said the armed forces of two sides need to establish further cooperation to preserve regional security and achieve their common goals. The commander then referred to his latest visit to Damascus to take part in a trilateral meeting with his Iraqi and Syrian counterparts on the regional security and added during the meeting, he held some discussions on military cooperation between the three countries. “We also exchanged views on Iran-Iraq cooperation in Arvand Rud to strengthen the Persian Gulf’s security,” he noted. Elsewhere, the top general said during the meeting, he also urged the reopening of Khosravi border checkpoint for Iranian religious tourists. “The Iraqi official promised to provide Iranian religious tourists with a safe road through Diyala province and reopen Khosravi border checkpoint in the near future so that Iranian religious tourists could also travel to Syria through Iraq,” he said. “The Iraqi side also expressed his country’s preparedness to prepare the border routes. Meanwhile, the Syrian side has already announced its basic readiness to take part in the project,” he said. The Iranian commander also said other issues of mutual interest were discussed during the meeting including Iran and Iraq air defence cooperation. “We feel some air threats from our western borders. To cope with any potential attack, we feel that Iran and Iraq should establish air defence cooperation,” he added. Holding training courses and joint maneuvers to share experiences were among other issues discussed during the meeting. The top general also referred to the presence of American forces in Iraq and said the Iraqi officials have given assurance to the Islamic Republic that they won’t cooperate with the US sanctions against Iran. “So far, they have had good cooperation with Iran and the Iraqi commander gave us assurance that his country would have more controls over US forces. He maintained that the US forces are stationed in Iraq for training purposes only,” he concluded.